Joesph Goebbels was the brilliant propagandist that invented the mass media strategies in play today. 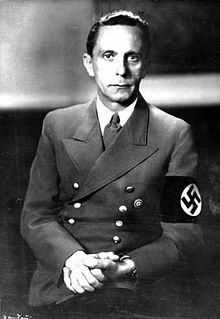 Paul Joseph Goebbels (German: ( 29 October 1897 – 1 May 1945) was a German politician and Reich Minister of Propaganda of Nazi Germany from 1933 to 1945. Goebbels was one of Adolf Hitler's close associates and most devoted followers, and was known for his skills in public speaking and his deep, virulent antisemitism, which was evident in his publicly voiced views. He advocated progressively harsher discrimination, including the extermination of the Jews in the Holocaust.